The militant Partido Manggagawa (PM) today called for a stop to the killings due to the war on drugs and justice for one of their leaders ambushed last Saturday. PM joined the big mobilization of the coalition iDefend (In Defense of Human Rights and Dignity) this afternoon to commemorate the anniversary of the declaration of martial law. “On the 44th anniversary of martial law, the struggle for human rights and democracy for all remains as relevant and critical as ever. With the war on drugs claiming thousands of lives and a state of lawlessness imposed on the whole country, civil liberties and democratic freedoms are under clear and present danger,” stated Wilson Fortaleza, PM spokesperson. The iDefend members started assembling at 2:00 pm today in Bustillos Church before marching to Plaza Miranda for a mass and program. 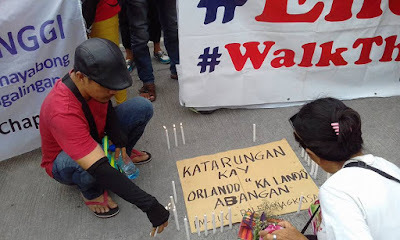 At 6:00 pm the iDefend marchers lighted candles to commemorate the victims of martial law, the war on drugs and political killings of human rights defenders like Abangan and Capitan. Also in Cebu today, PM and other militant and human rights groups held a rally to call for justice for Abangan and Capitan. They marched around downtown colon this afternoon to call for a stop to the killings and to never forget the terror of martial law. “We call on the authorities for a swift but thorough investigation of the killing of Ka Lando Abangan. We know that they are already pursuing leads that point to certain suspects. Still we urge them not to stop at the arresting suspected gunman but to probe who the mastermind is. Ka Lando is not involved in drugs and is respected in his community as an activist, so we believe that his killing is politically motivated and is related to his work as a human rights defender of urban poor and workers,” explained Dennis Derige, PM-Cebu spokesperson. Derige also revealed that five days before Abangan was shot to death, he escaped a first attempt on his life. He recalled that several armed men riding motorcycles came looking for Abangan in a place where he frequently hangs out.